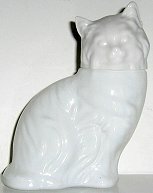 This white cat cologne bottle is 3 1/2" high x 2 1/4" wide. Made of glass. Mark on bottom says Avon. Previously owned but in good condition. No visible defects. Cologne bottle is empty.